Just because most people know warrior cats does not mean we will act like cats using their herbs, although you might find some they use. Here are a few herbs that i know of that would help others. For anyone who would like to be a medic may see this too, but just know being a medic isnt all just about knowing herbs; yet that is all i will show you today. Adequate Sleep: Not exactly a substance, a lack of rest can cause serious problems. Resting for the amount of time needed can also cure a variety of alignments and prevent even more. Some things it can cure are mood swings, grumpiness, blurred vision, headaches, a change in behavior and drowsiness. It can also prevent colds and minor diseases by boosting your immune system. Food (various kinds): A simple remedy for life's easy fixes, food is an important and basic part for any creature. A lack of food can cause mood swings, drowsiness, a lack of energy, aggression, stomach pains, a lack of interest to others and overall physical weakness. Eating a good sized meal will heal these problems and offer needed nutrients. Grass: A common plant that is found just about everywhere, it is known for inducing vomit in a non-lethal way. When the plant is swallowed but not chewed enough, the plant will rub at the inside of an animal's stomach and cause vomiting which helps to ease stomach pain and get rid of poisonous plants. It also helps to relieve throat inflammation and is a good source of nutrients. Lavender: An evergreen shrub with flowers that have pastel bluish purple petals, the plant has strong antifungal qualities, helping to disinfect an area that has a fungal disease. If the plant is turned into mush, you can rub it on wounds to increase its effectiveness. This same mush can also be placed on the forehead to heal headaches. Peppermint: A strong scented herb that belongs to the mint family, it's all green but produces a purple flower when it's mature. The plant itself usually tastes sweet, but when the flower is present the plant becomes bitter. It is usually found in wet soil conditions with a stable water source nearby and some shade. If the plant is eaten, it can aid digestion and calm bad breath. Cranberries: A short evergreen shrub that thrives in wet areas, the plant is mainly green with plump red berries that are hard. The taste is strong and bitter, but it has been proven to cure and prevent urinary tract infections. When squished, the plant's skin will release a red dye. Basil: Mostly known for its wax-looking leaves, this sweet-tasting plant in areas with intense sunlight, moist soil and warm weather. It grows the most during the summer, but during the winter it begins to die out in northern regions due to the cold and snow. There are many types of basil, but this plant usually have green or purple leaves, depending on the type. Ingesting it has been proven to help reduce stress and asthma, and applying it to the skin helps ease bug bites. White Willow: A type of willow tree known for the undersides of its leaves having a white tone, the bark is usually a grey-brown color. It grows in moist soil in cold or temperate regions, and, though the tree grows fast, it can easily die from natural diseases. Eating its hard bark is known to reduce fevers, headaches and various physical aches such as arthritic pain. It's also an anti-inflammatory. You need to chew thoroughly or you'll get splinters. Aloe Vera & Red Aloe: Found in dry, rocky climates, the aloe plants are known for wide and thick leaves that store a medicinal gel. It is great for soothing minor cuts, various burns, skin irritation and dry skin. The plant's gel also gives a cooling effect when applied on the skin, helping to relieve various pains. It is most effective when applied directly on the skin instead of the fur, but do not digest it! This plant is poisonous for internal uses. Ginger: A plant known for its thick, brown roots, ginger grows in warmer climates. The plants has leaves all year, and grows pink and white clusters of flower buds during the spring. During the summer and autumn, it has yellow flowers. The roots are high in vitamins and minerals, and have antiviral, anti-toxic and anti-fungal properties when ingested. It must be eaten in small doses or it could be toxic. It also eases nausea from pregnancy and motion sickness, eases stomach pain, treats allergies, and improves blood circulation by acting as a blood thinner. Echinacea: A plant related to the daisy, it comes in various forms depending on the species, but they are known for its textured center, long petals and tall stem. It flowers only during the summer, and prefers large open areas like moist to dry prairies. It is known to treat symptoms from a cold and flu, such as sore throats and runny noses. It also helps relieve headaches and pain from bee stings, reduces fatigue, improves immunity, and treats urinary tract infections. Milk Thistle: This plant is known for its purple top and green leaves with white markings. It grows in both wet and dry conditions, and it needs at least some light in order to live. The most potent part of the flower are the seeds when they are ripe. It makes a great antioxidant, prevents liver diseases, lowers the potency of poisons that affect the liver, boosts the immune system, and soothes inflammatory cardiac diseases. Blucrest Shrub: A shrub that looks exactly like the blueberry plant, it isn't until the berries are almost ripe that you notice it's different. The indigo color starts to turn orange, but the top of the berry still has a flared blue crest like a blueberry. The inside of the berry is also orange. It grows specifically in the Archaic Plains and Lunar Meadows, and it has been proven to cure various mental and behavioral disorders, such as depression, paranoia and schizophrenia, when at least several are eaten. It works best fresh, so dry and/or old fruit lowers the potency. 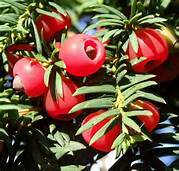 The shrub only produces fruit in summer and autumn. Saphberry: A plant that looks exactly like a raspberry plant, the fruit and leaves near the fruit is a different color than normal. The fruit is a vibrant neon green and the leaves are a soft powder blue. The plant also has a citrus smell to it, like a lemon. This plant is found in the Archaic Plains, Lunar Meadows, Idyll Woods, Divinus Temple and Verite Forest. It grows fruit year-round, and eating the fruit has been known to cure plant poisoning. Within 1-2 hours, depending on how long the poison has been in the animal's system, it heals the animal but forces the animal to go unconscious during that time. Eating this plant without being poisoned has been known to cause erratic behavior and hallucinations. Starberry: A plant related to the Saphberry, it also seems to look like a raspberry plant, except both the fruit and the leaves near the fruit are a powder blue. Unlike the Saphberry plant, the scent is actually sweet, not citrus-like. It produces fruit year-round. The fruit is only potent during early evening to early morning hours, when it sparkles with divine power. Eating the fruit during those hours will heal any poisoning, whether plant or animal related, but the animal must rest for several days and have a pescetarian diet, or will get a deadly fever. Aloe Vera & Red Aloe: Found in dry, rocky climates, the aloe plants have wide and thick leaves filled with gel. For internal uses, this plant is poisonous. It can cause vomiting, a lack of appetite, diarrhea, dehydration, headaches, kidney problems, and a change in the color of urine. It is also known for causing depression and tremors to canines and felines. Deadly Nightshade: A shrub that grows in moist and shady areas, the leaves and flowers are extremely poisonous. It has a soft scent, but it can be recognized for its bell shaped flowers that are a dark hue around the edge. When digested, it can cause severe stomach aches and problems, diarrhea, extreme salivation, dehydration, decreased heart rate, and dilated pupils. It is also known for causing depression, overall physical weakness, mental confusion, and a change in behavior. Chamomile: A green plant that looks similar to a white daisy, in heavy doses this plant can cause uterine contractions which increase the risk of having a miscarriage for pregnant females. Azalea: While beautiful to look at, this flowering shrub is lethal. It is mainly filled with leaves, but when the flowers bloom in the spring, the flowers can live for several weeks. It is found mainly around other trees, living in the shade of taller plants. If the leaves are ingested, a creature can suffer vomiting, diarrhea, extreme salivation, a lack of appetite, cardiac problems and paralysis in the legs within a few hours. Other symptoms include depression, overall physical weakness, a lack of coordination, and weak heart rates. If not cured, the creature could go in a coma or die in a few days. Deathberries: One of these berries will kill any wolf quickly without medical treatment right away. They will be very sick for the next few days if they got medicine for it. DB has dark green leaves and scarlet berries. Otherwise known as 'yew'. (the only thing it is healthy for are birds).